Furever Pets … Great Doggie Treats & Gifts For Christmas! Need an idea for Christmas gifts for the doggies? A friend of mine who is a massage therapist (Maddy Turner) also has a business called Pawsative Touch. Can you guess who she massages? Yes you win the big Shopping Out Loud prize (worthless of course) for guessing that it’s massage for the doggies! Check Maddy’s website. Trust me, if you get the gift of doggie massage that pup will never forget you. She came over to massage Sawyer thecorgi the other day so I could see her techniques (I wrote a story about her business for the Oregonian). Sawyer is such a little boo boo. The minute Maddy laid hands on him his eyes rolled back in his head and all you could see were the whites of his eyes for the next 30 minutes. He didn’t move a muscle. He’s such a little pushover. Speaking of Sawyer thecorgi. I got him a new halter leash today at Furever Pets on NE Broadway. They remodeled the store a couple of months ago and it’s about twice the size these days – with lots more room for pet supplies, freezers for food and treats and many more toys and various asundry dog acoutrements. I had also been looking for the dog ball of the century … and found it there. I love this ball. It’s the best invention ever. And you don’t have to be a professional baseball player to get it to go unbelievably far! This makes a good doggie gift too. Martha Stewart and Oprah’s favorite chocolates! 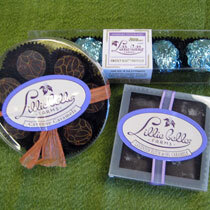 And speaking of great gifts, have you heard of Lilliebelle Farms artisan chocolates? Oh my. I was in Jacksonville last month doing a series of stories on some of the tourist sites and of course shopping, in Southern Oregon. Lillebelle Farms is located in Central Point, which is very near to Meford. Let me tell you about my favorite chocolates – the Cayenne Caramels. Raising the delectable candy up to your lips, you inhale first the sweet, rich smell of the chocolate. As you slowly (please) bite into it you taste the creamy expected richness of the divine sweetness. Next your mouth is filled with the velvety, sweet caramel as your eyes drift part way closed so you can shut out the visual and concentrate on your taste buds. Finally, finally the hot, hot bite of the cayenne pepper catches you by surprise as it cuts into the chocolate and caramel – swirling and streaming down a final sweet and hot path down your throat. Rumor has it that Martha Stewart discovered the artisan chocolates and sent box after box of the Lavender Sea Salt chocolates to friends two years ago at the holidays. Then Oprah followed suit and Lilliebelle’s hasn’t had a spare moment since. They are a tad spendy but worth each and every cent.